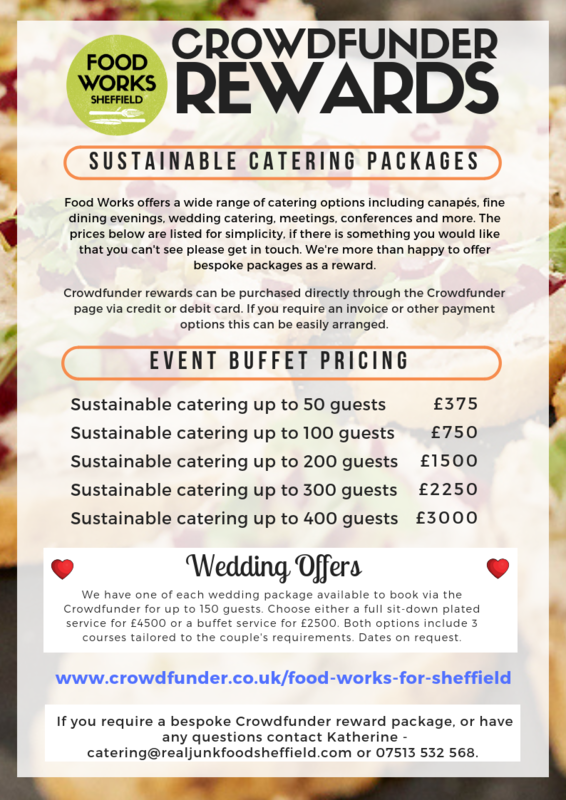 It was the 12th day before Christmas and The Real Junk Food Project Sheffield // Food Works released new Sustainable Catering Packages PLUS 2 Wedding Catering Packages for 2019! Food Works will offer a wide range of catering options including canapés, fine dining evenings, wedding catering, meetings, conferences and more. The prices below are listed for simplicity, if there is something you would like that you can’t see please get in touch. We’re more than happy to offer bespoke packages as a reward. We have 3 years of catering experience behind us so you will be in good hands. Crowdfunder rewards can be purchased directly through the Crowdfunder page via credit or debit card. If you require an invoice or other payment options this can be easily arranged. If you require a bespoke Crowdfunder reward package, or have any questions contact Katherine – catering@realjunkfoodsheffield.com or 07513 532 568.